This is by no means a comprehensive list of satire in The Adventures of Huckleberry Finn, but when your teacher asks you if you can identify satire in The Adventures of Huckleberry Finn, you'll be able to give her some examples. (1) Twain satirizes religion with Huck and Jim's litany of superstitions. Huck's Pap returns for the sole purpose of grabbing Huck's wealth. The duke and the dauphin commit fraud several times in an effort to get rich. Huck can't bear to return to the widow's house. The Grangerfords and Shephardsons are involved in a nasty feud that leads to several deaths. Huck and Jim come across several murdered people throughout their adventures. Huck marvels at human cruelty toward one another as the duke and dauphin are tarred and feathered. Tom's band of robbers speak incessantly about murdering and plundering, yet only pretend Huck's quest for adventure and danger lead him and Jim into trouble Tom abandons common sense with a preposterous plan to rescue Jim. Huck doesn't understand why they just can't unlock the shed and run away with Jim. Tom responds, "Well, if it ain't just like you, Huck Finn. You can get up the infant-schooliest ways of going at a thing. Why hain't you ever read any books at all? Whoever heard of getting a prisoner loose in such an old-maidy way as that?" The tom-foolery nearly gets the boys and Jim killed. (5) Twain pokes fun at melodramatic art and poetry with a look at the late Emmeline Grangerford and her unintentionally hilarious poem, "Ode to Stephen Dowling Bots, Dec'd." Huck is impressed: "She warn't particular, she could write about anything you choose to give her to write about, just so it was sadful. Every time a man died, or a woman died, or a child died, she would be on hand with her "tribute" before he was cold." (Chapter 18). The ultimate irony in Huck Finn is that it's been banned for being both racist and not racist enough. Here are some more examples of irony in Huck Finn. (1) Pap is angry at Huck…for going to school (situational irony). (2) Huck chides himself for his sinful ways, allowing a slave to escape (dramatic irony). (3) Huck's Pap rants about a black man he encountered in town: "They said he was a p'fessor in a college, and could talk all kinds of languages, and knowed everything. And that ain't the wust. They said he could vote." Pap describes a man superior in intellect to himself, yet scolds the government for letting him vote. (situational irony). (4) Huck thinks he's helping Jim escape, but Jim helps Huck more than Huck helps Jim. (situational and dramatic irony, kind of). Jim comments on the irony of being a slave: "I's rich now, come to look at it. I owns myself, en I's wuth eight hund'd dollars." (verbal irony). (5) Huck comments on the widow always helping rapscallions and deadbeats, similar to the new judge in town who went out of his way to help Huck's pap. (situational irony). (6) When the Grangerfords and Shepherdsons go to church, they leave their rifles at the door and listen to the gospel of peace. Their feud recommences immediately upon leaving. (situational irony). (7) Jim tells Huck he's going to help his wife and kids escape, causing Huck to comment, "I was so sorry to hear Jim say that, it was such a lowering of him." (situational irony). (8) Huck consistently comments how doing right makes him feel bad, mainly because what he's been taught as right is wrong. (situational irony and dramatic irony). (9) Huck learns how to spell his name from Buck, who spells it wrong. (situational). Review Mark Twain’s classic with these study helps. 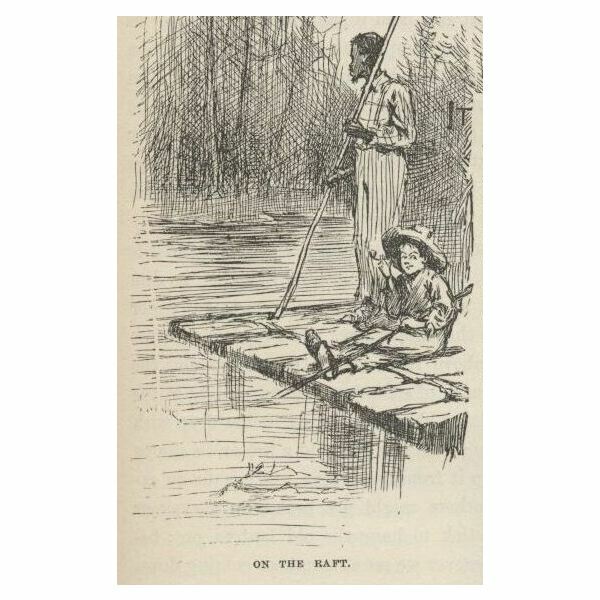 Test Your Knowledge of "The Adventures of Huckleberry Finn"